A pair of tents sit located in one of the homeless camps on the hillside above Wal-Mart in south Glenwood Springs. Charitable organizations that provide services to the area’s homeless and transient population are responding after concerns were raised by local elected officials and police that those very agencies may be part of the growing problem. 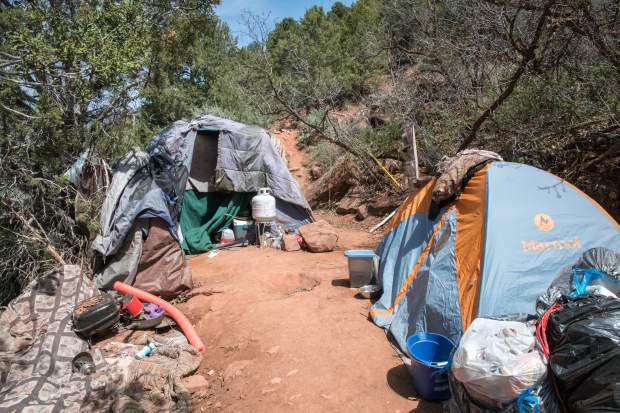 At the April 19 Glenwood Springs City Council meeting, Mayor Michael Gamba and others spoke to some of the ancillary issues leading to safety concerns around the proliferation of homeless camps in the hills above town. “There’s been a lot of people who have suggested that some of the charitable organizations that provide services for these transient groups are part of the problem,” Gamba suggested to Police Chief Terry Wilson, who led a late-night discussion of the issue. “One of the consistent factors that I found when we talked to communities that describe having very little to no issues, or a homeless populous in their community, is the complete and utter lack of services that their community offers to that demographic,” replied Wilson. Karen Peppers, director of Feed My Sheep, a nonprofit organization for the homeless which offers breakfast, lunch, hot showers, laundry, storage, and other charitable services at its day center, and an overnight shelter in the winter, shared her first-hand perspective. The winter overnight program Peppers mentioned began in 2006. It started out in two motel rooms but eventually grew to the basement of the Church of Christ. It provides a warm place with air mattresses, pillows, sheets, and blankets during wintertime. Feed My Sheep started the program after a local homeless woman died of hypothermia. Some residents voiced concerns at the City Council meeting regarding the fire hazards they believe these campsites pose, and the amount of garbage their occupants leave behind. “One of our biggest issues, in the last three years we’ve had three fires in the vicinity of Wal-Mart. That seems to be our most volatile area,” explained Glenwood Springs Fire Chief Gary Tillotson. Peppers certainly agrees with Tillotson regarding the seriousness of the situation on the hillside east of Wal-Mart. However, she attests those encampments do not house the people her organization helps on a daily basis. “I know one thing, our group, you would never see a fire at their camps,” Peppers said. She insisted that those who utilize Feed My Sheep’s services tell her immediately whenever they see other homeless people or transient groups building fires. “We’ll go up there as a team and we’ll tell the people that ‘you are threatening Feed My Sheep with this because we don’t do that. We know better than that,’ ” Peppers said. Three years ago, Peppers and others from Feed My Sheep were doing one of their many mountain cleanups (which they still do). This particular one was behind Wal-Mart, and she said she was appalled by the sheer number of unused canned goods left behind as trash. From that point forward, anyone who received a canned good from Feed My Sheep had to return it once empty before getting another to help alleviate trash and wastefulness. “I can understand the frustration because I’m just as frustrated as the city is, as the community is, everybody down here is tired of it,” she said. Peppers emphasized the litter, more often than not, gets left behind by homeless or transient people who do not use Feed My Sheep, because they do not like the rules. Those rules include, but are not limited to: no panhandling, no possession or use of alcohol, marijuana, or any other illegal drugs. “I’m not afraid to let this community know about Feed My Sheep,” said Peppers. “I’ve never seen a City Council person down here ever,” said Peppers. According to Peppers, Garfield County gives Feed My Sheep $27,000 a year. The vast majority of the nonprofit’s budget, however, comes from private donors. The City Council, at that same April 19 meeting, discussed possibly installing a Portland Loo toilet downtown that would have cost taxpayers upwards of $100,000 and would have provided one stall. After speaking with all seven City Council members, including the mayor, only one, Councilor Todd Leahy, said he had ever set foot inside Feed My Sheep since their time in office. Council members Steve Davis, Jonathan Godes, Rick Voorhees, Shelly Kaup, Jim Ingraham, and Mayor Gamba said they had not. Debbie Wilde, acting executive director of LIFT-UP — another charitable, nonprofit organization serving areas from Aspen to Parachute — echoed a lot of Pepper’s sentiment regarding the notion of charitable organizations being partly responsible for the homeless and transient population issues surrounding Glenwood Springs. LIFT-UP sponsors the free meals that are offered nightly in Glenwood Springs and in Rifle, as well, with the help of different volunteer organizations who prepare and serve the meals. One example being that of a 33-year-old woman named Phenniux McCune. McCune made the trip down Feed My Sheep’s stairs for the first time in June of 2017 after living in a tent for a few months. Today, McCune, like so many who once depended and still do on charitable organizations like Feed My Sheep and LIFT-UP, works a steady job and no longer lives in a tent. In 2017, Feed My Sheep saw 9,858 visitors. LIFT-UP, with the assistance of countless community volunteers, served 22,349 clients in 2017. Council members agreed at last week’s meeting, at the suggestion of Commissioner Martin, to convene a community meeting inviting service organizations and others who have a stake in the homeless issue to the discuss the matter and seek solutions.